The main difference this week has been the plastering. 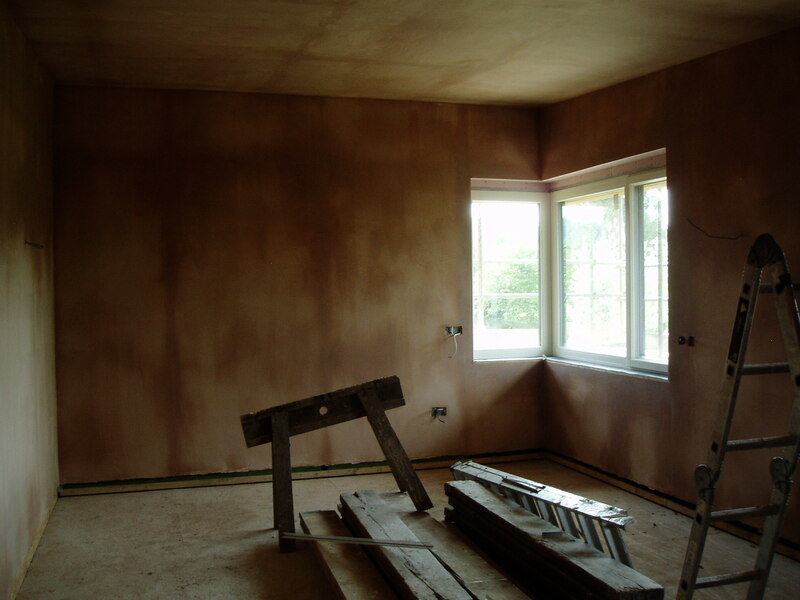 The house is now fully plaster boarded and the skim plaster has been put on in the two upstairs bedrooms. A dark chocolate shade when first put on, drying to something lighter. 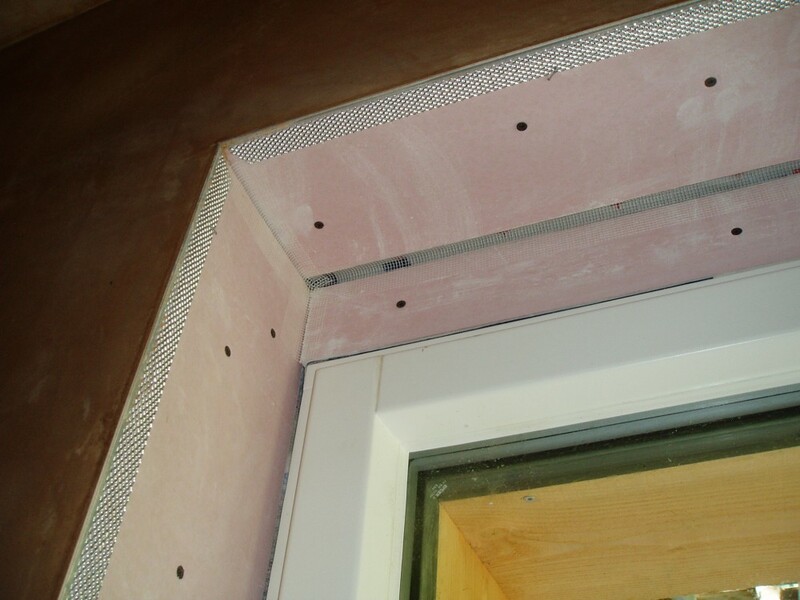 On this photo you can see the detail around the window of the metal trim where it has not yet been skimmed. 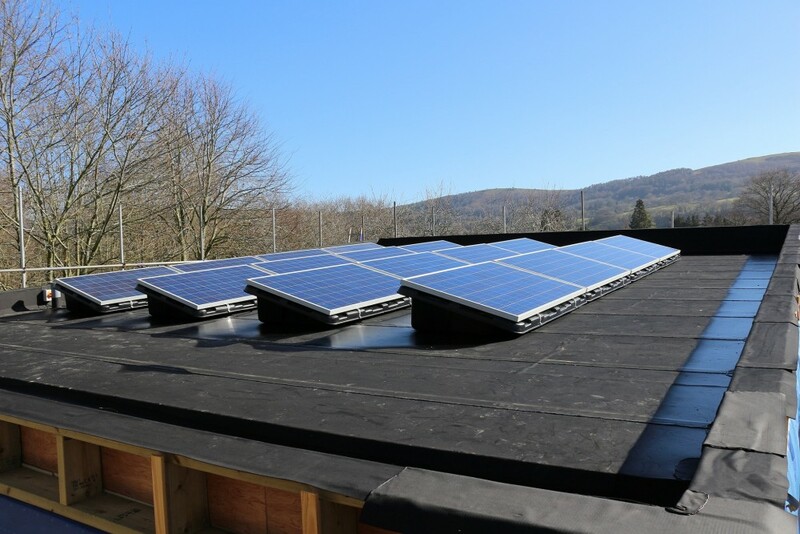 Also this week the solar panels have been connected so we can now make use of the energy which we are generating. Pity though that the Feed-in Tariff is a 1/3 of what it was at Christmas. And finally looking back over the photos, I notice that we have not had a long shot for a while. Rather too many buttercups but they do look pretty. Inside, the most noticeable work has been going on up in the landing. 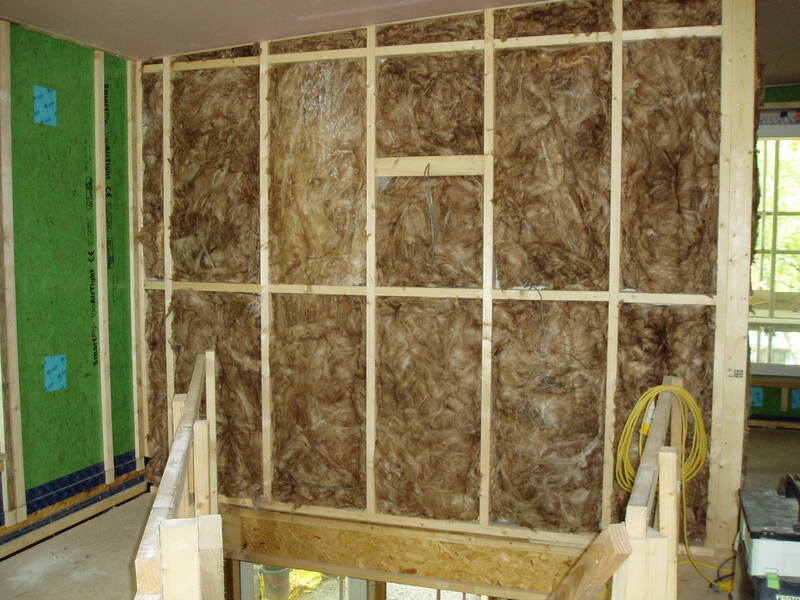 The bathroom wall has a covering of Fermacell Gypsum Fibreboard which does not need plastering and is moisture resistant. 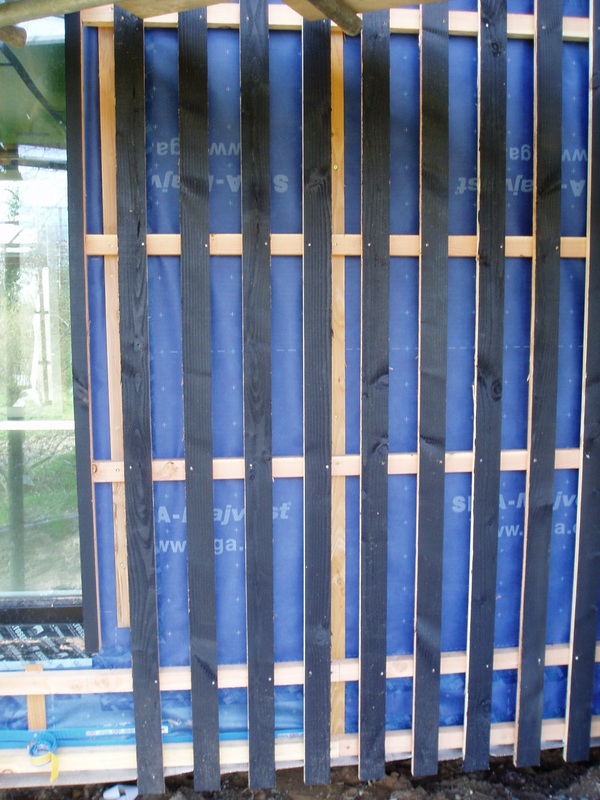 The studs on the outside of the bathroom been filled with Earthwool. Despite the name it does not include earth or wool, but instead recycled glass bottles and sand. 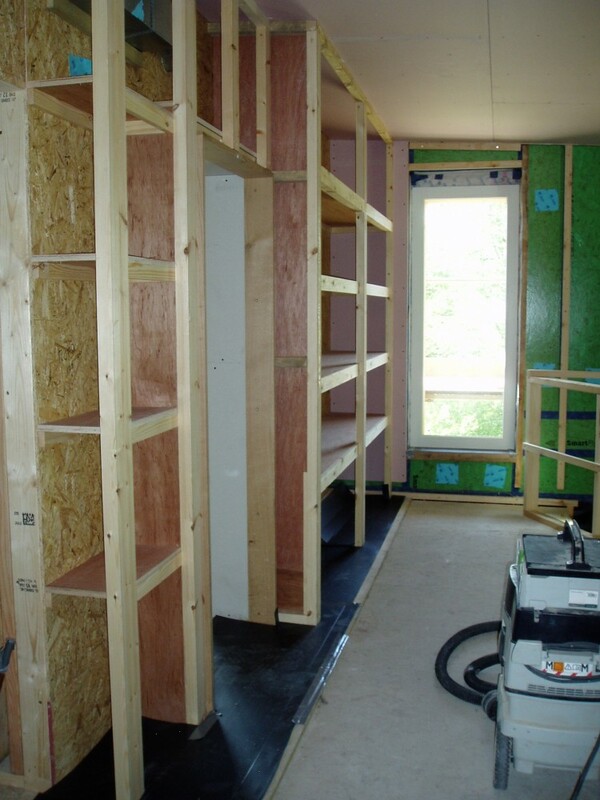 The landing cupboards and shelves have also been going up, which will act as our loft space. But for me the biggest change has been removing the temporary flooring from the void over the entrance to the library. Suddenly you can see the full height window and how the pod juts into the house. Inside the house the door frames are being installed as well as the frames for the landing cupboards. 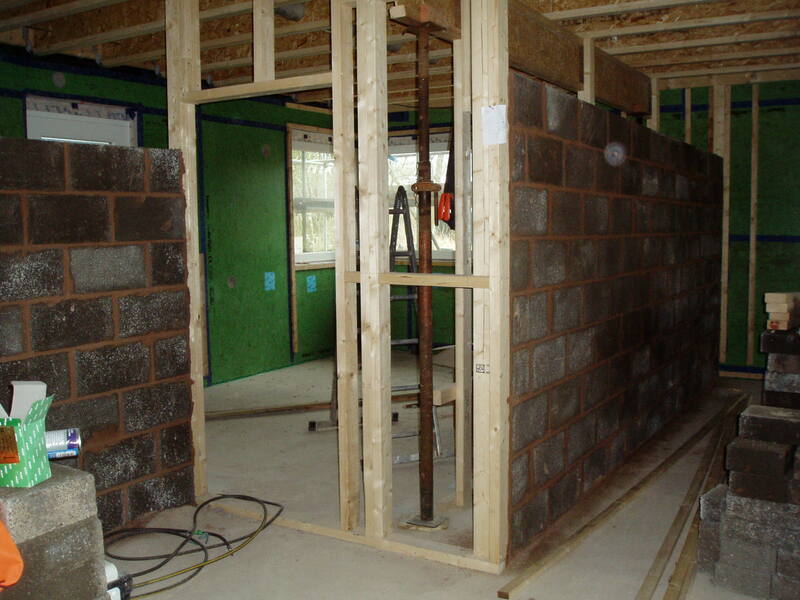 The wall between the wet room and Mike’s study has boarded so we are beginning to see the shape of the rooms. The still weather meant that Mike was able to fly his drone again, so here is a video of the house showing the new cladding and the solar panels on the roof. 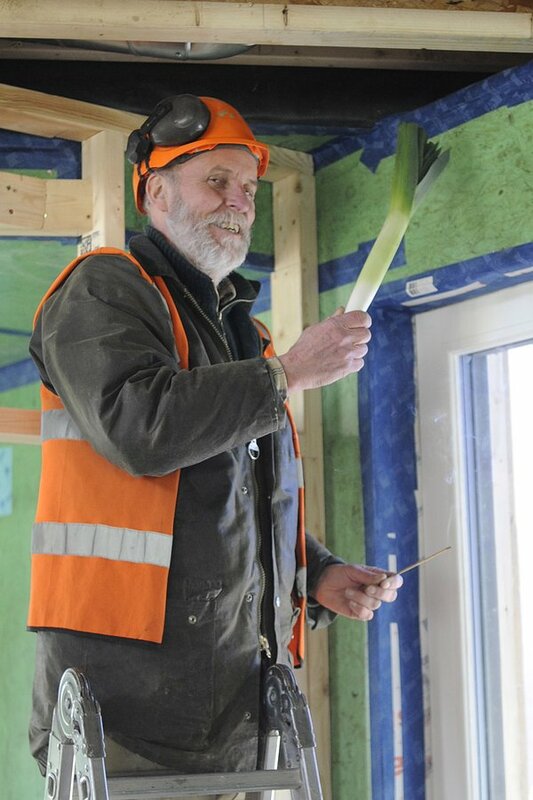 Dan and Dan have been working on the cladding on the North and East sides. Meanwhile Petrus and Henry started working on the West and South sides. Now the Dans have joined them on the South side, so all being well they should meet in the middle. 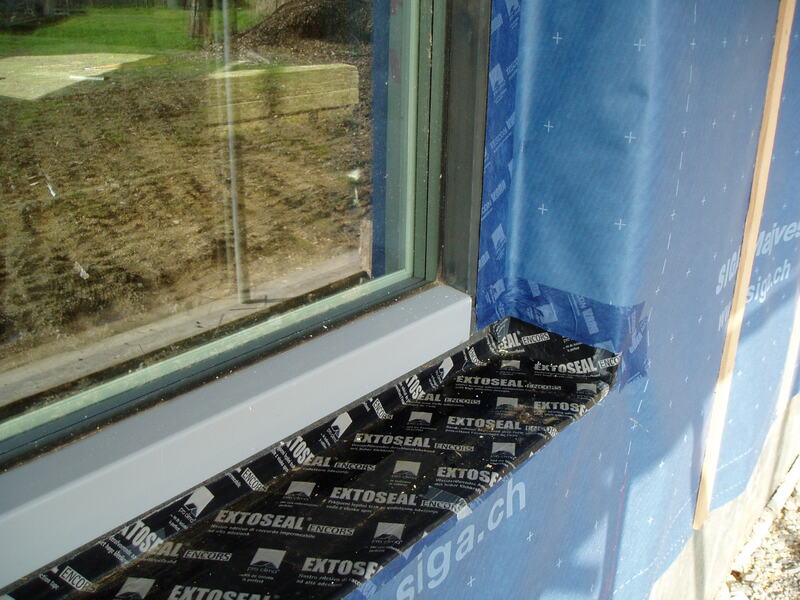 The walls above the corner windows are being left to last as we are waiting for the metal covers that direct the rain away from the windows. Condensed into one minute, a video of how the pod was clad. 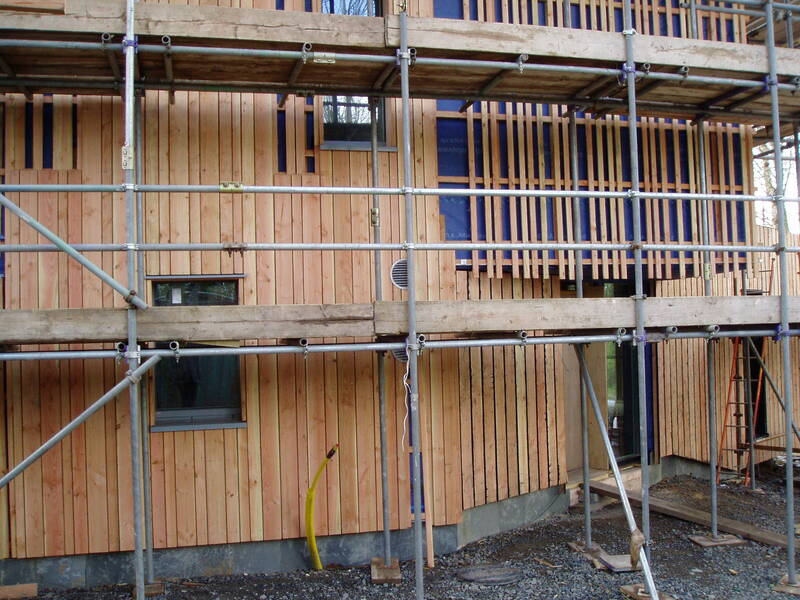 Work started this week on cladding the main part of the house. Again Douglas Fir, but left unpainted to gray naturally. 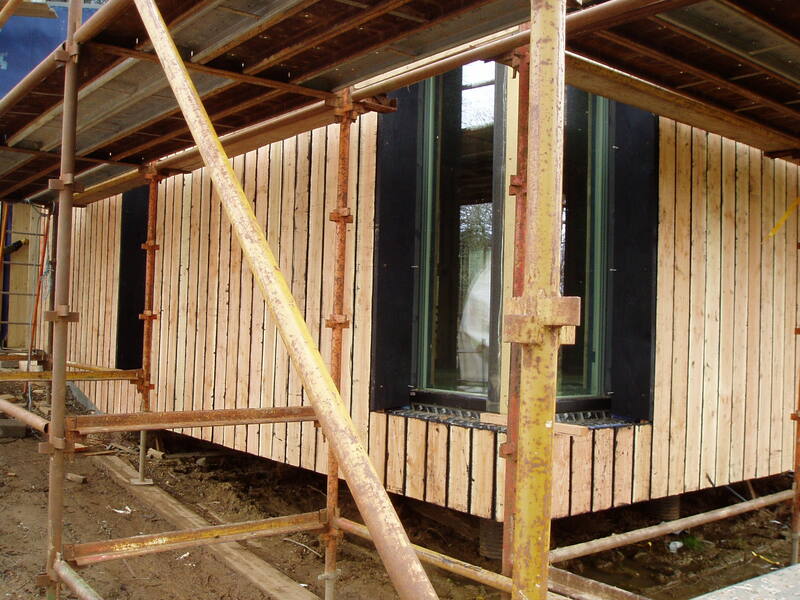 The pod cladding has all the planks the same size, but the house has a random pattern of different widths. Quite a challenge. Inside work has continued with the plumbing and electrics, but that does not produce many nice photos, so I will turn may attention to the work on the outside. Work has started on cladding Mike’s study, aka “The Pod”. At the back are vertical batons holding the blue fabric on and then horizontal batons on which the back layer of upright batons are fixed. They are local Douglas Fir which has been painted black. 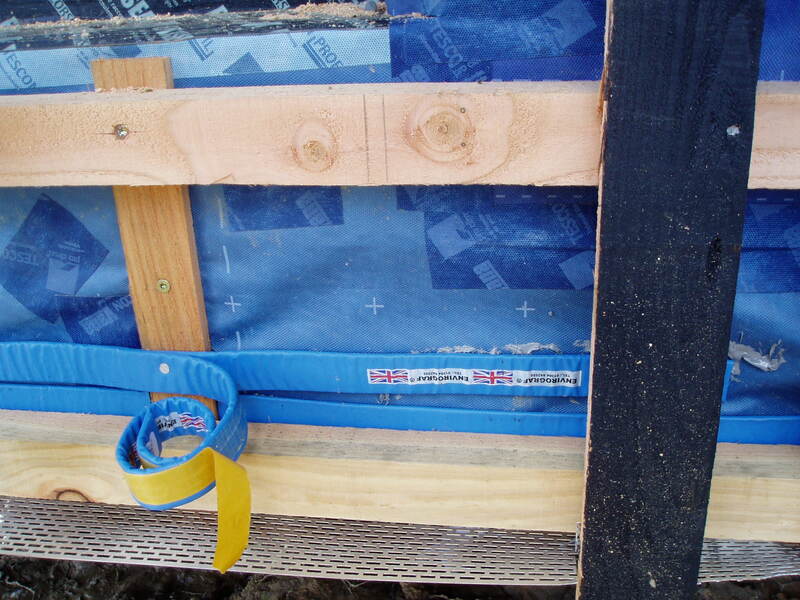 Around the bottom you can see the metal mesh to stop insects making a home behind the cladding and the blue firestop tape. Apparently that will quickly expand if there is a fire helping to seal off the air gap behind the cladding and slowing any spread of fire. And then there is a front layer of wider Douglas Fir planks. They will also be painted black at some point. Last week was “Electricity week”, starting with Western Power connecting the house to the mains. 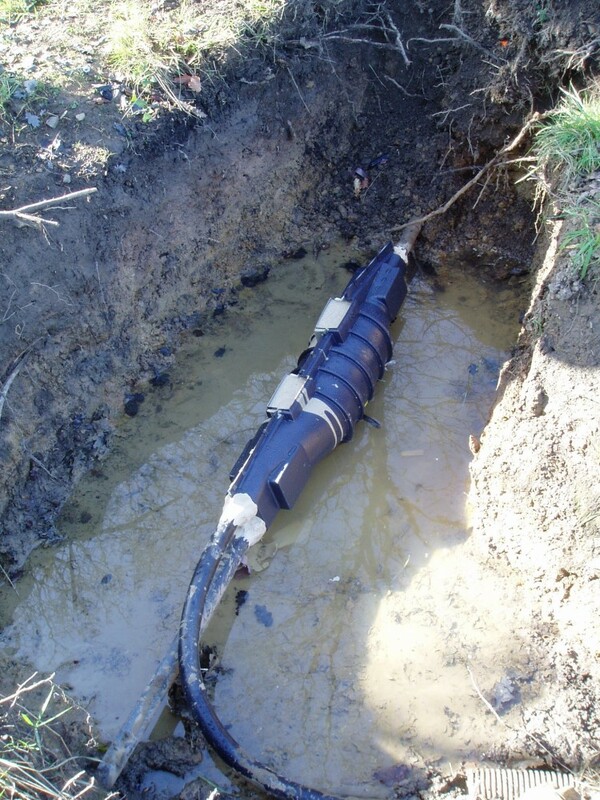 This involved tapping into the live mains which runs along the far side of the field. 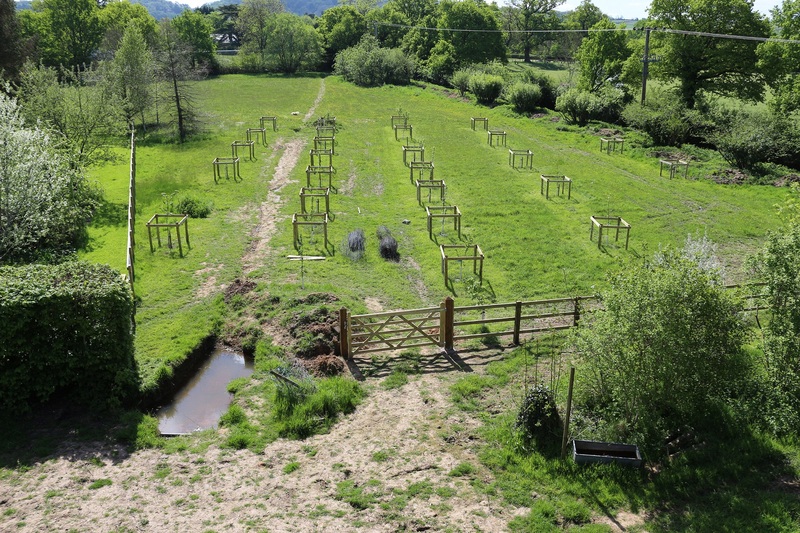 The house is too far from the mains to do the whole run as single phase, so the first part is done as a 3-phase connection. 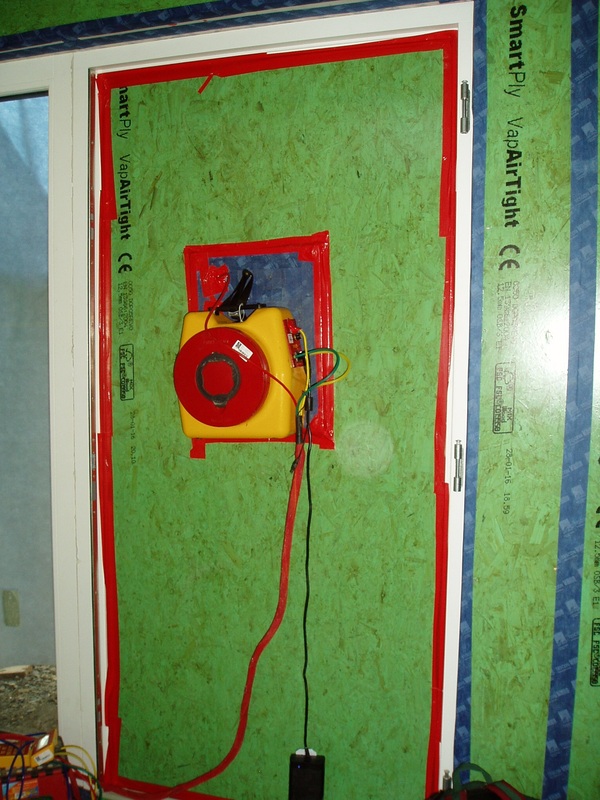 The photo shows the connection from the mains supply to a 3-phase wire. That hole only need a bit of water bailing out, but the connection from 3-phase to single phase had nearer 18inch of water so that was pumped out. Two days later Ecotricity turned up to put the meter in, so once the consumer unit is in we will be ready to power the house. Later in the week Caplor Energy erected the PV solar panels on the roof. For the technically minded it is a 4kW system with Enphase micro inverters, held in place on Solion mounts. We will also have a Powerflow energy box which will divert any excess generated electricity which is not being used by the house into heating the hot water. 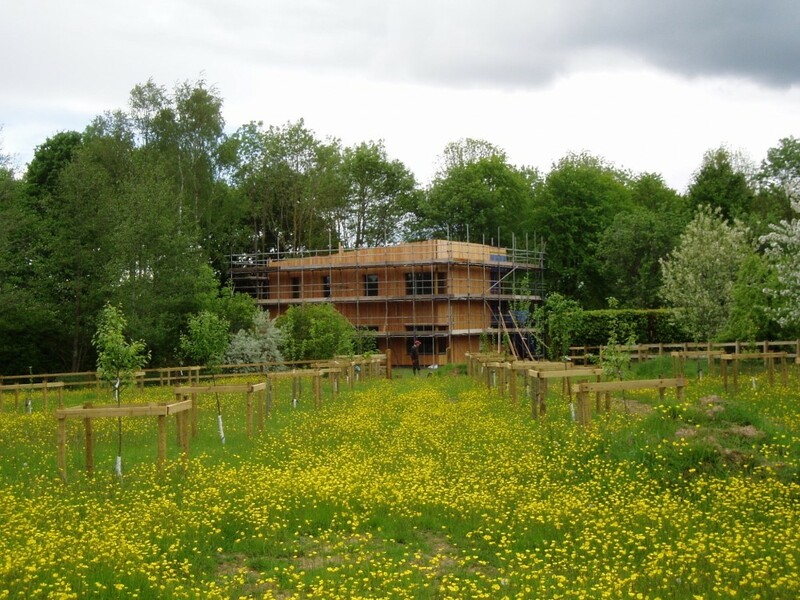 The panels are neatly hidden by the parapet of the house, so that they are invisible from outside. It seems that the email notification failed on the last post, so scroll down if you have not already read it. Time for a bit of a general catch-up. 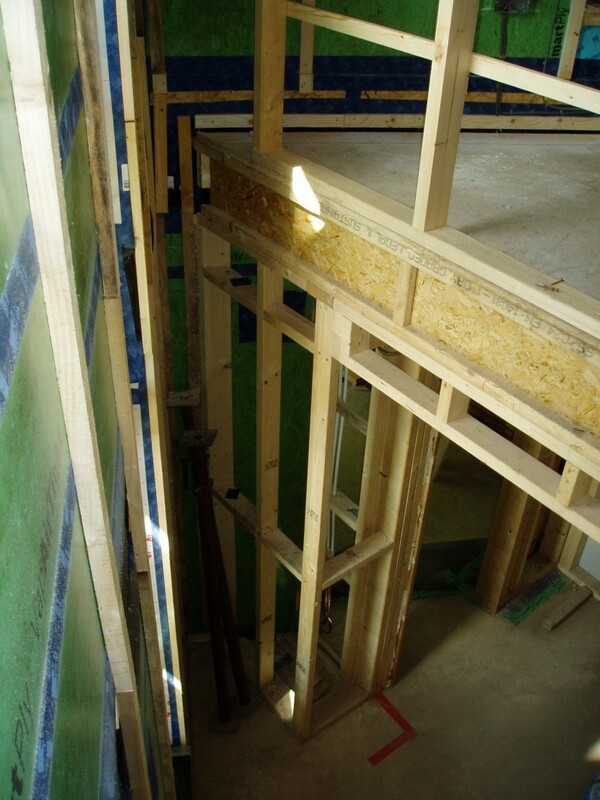 The biggest difference internally has been the building of the block walls at the back of the living area. 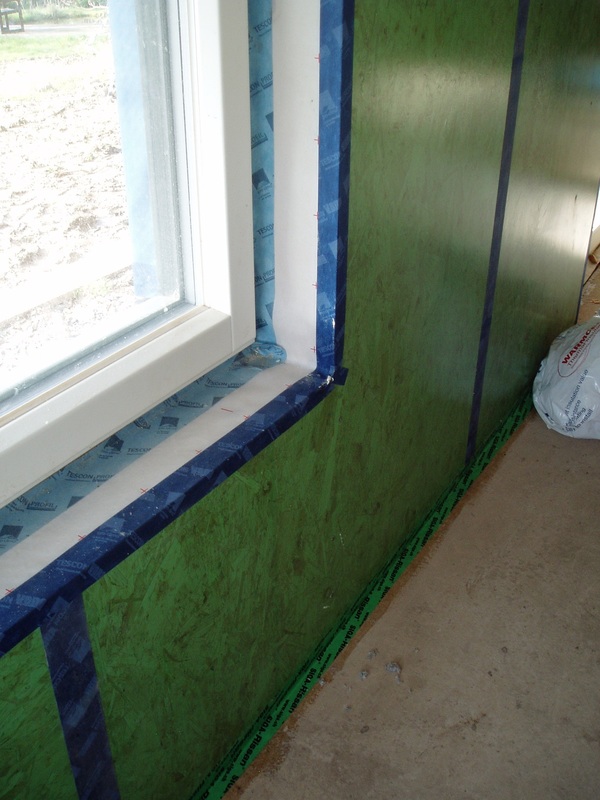 If all goes to plan these should act as a thermal mass and smooth out temperature swings. 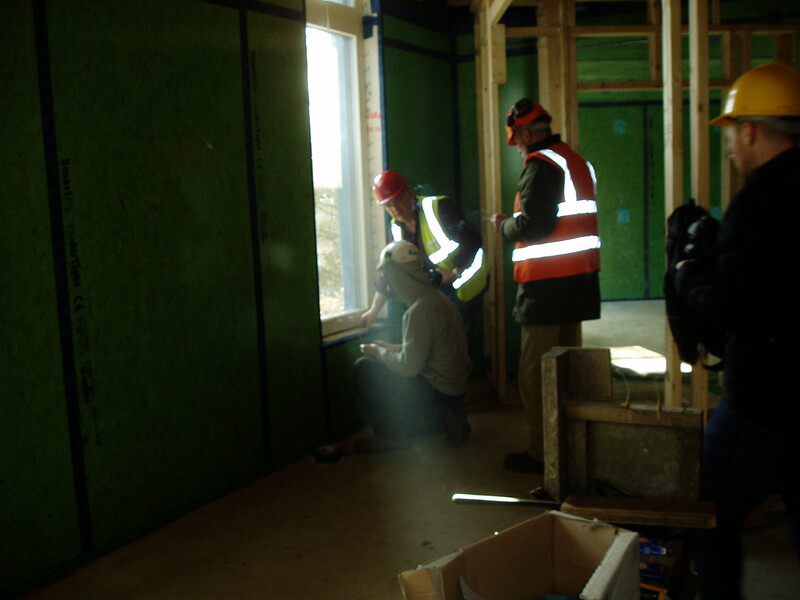 Siobhan, who is an Australian architectural assistant from Architype, has been visiting the site each week so as to get experience in how houses are constructed. 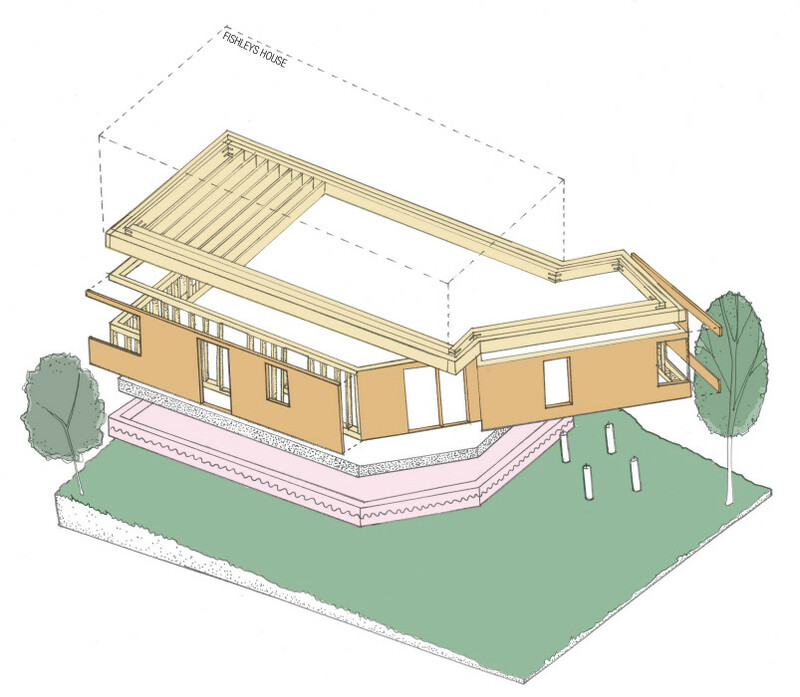 She has written about her experiences on site on her blog and created this nice exploded diagram of the ground floor build of the house. 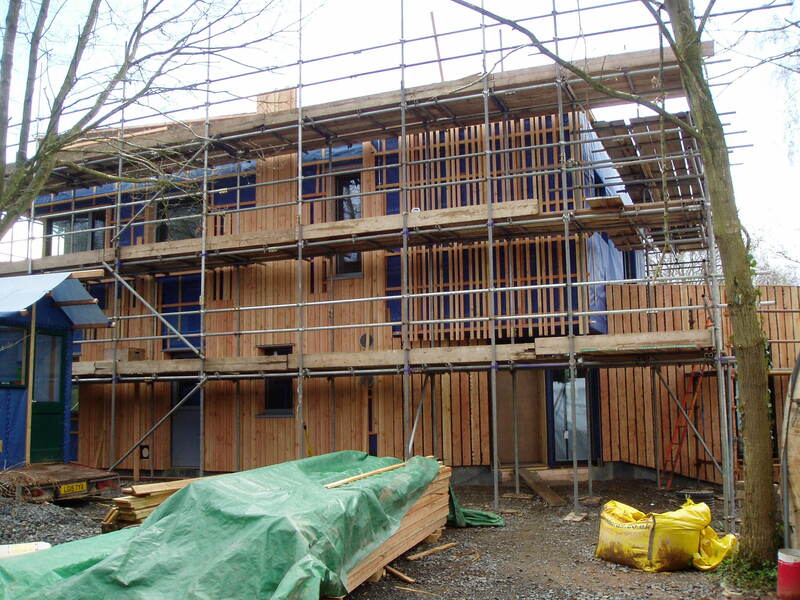 The build also had a write-up on the Passivhaus Trust website. So welcome to new readers of our blog who have subscribed as a result of the article. 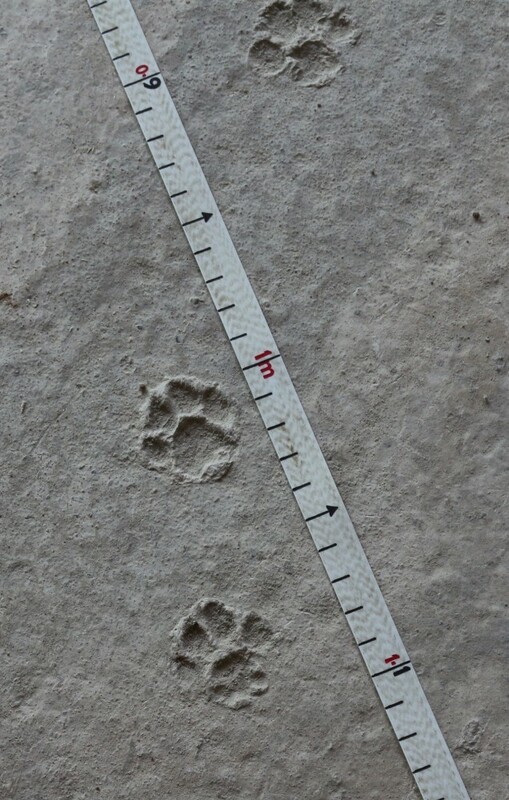 And finally sweeping the floor for the air test last week, showed that some-one had walked over the wet concrete, but was it Ella or next door’s small cat – Lillian. The results: 0.2 ach (air changes per hour) which every-one was very happy with. 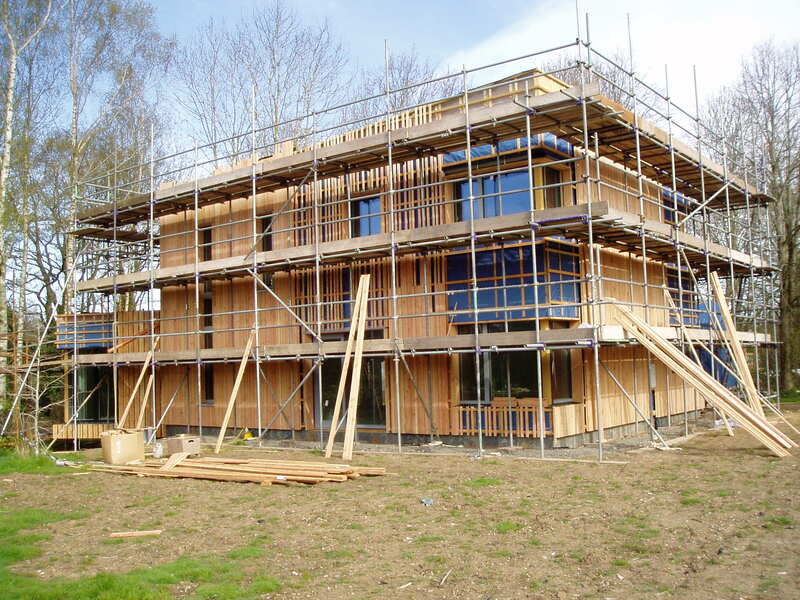 Apparently the Passivhaus standard requires less than 0.6, but our house will require less than 0.3 because of the number of windows. And that was including the cat flap. And finally, Henry and Dan decided to play a joke on Mike by telling him that there was a big leak in the most awkward section of the ceiling where the pod meets the house.